With Apple having released its smartphone series for 2017, many consumers find themselves making an iPhone X vs iPhone 8 Plus comparison. 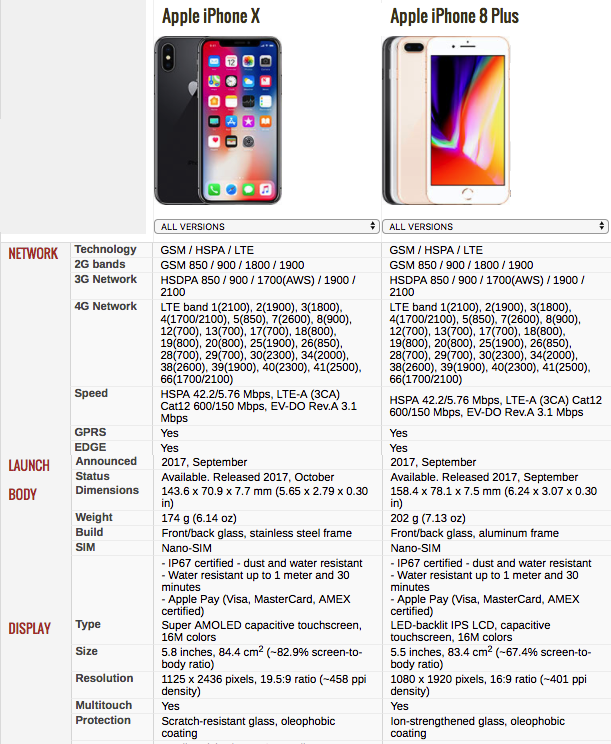 These two handsets can be considered the phablet releases from Apple during the previous calendar year, and it is thus natural to compare the qualities of the two. So here ValueWalk runs down the particular strengths and weaknesses of the two devices. The size of the two devices is always going to be of key importance in the iPhone X vs iPhone 8 Plus comparison. Smartphones are, after all, intended to be mobile, so the compact nature of their design is always critical. And this immediately favors the iPhone X, which has a larger display, yet delivers this in a more compact package, thanks to its wraparound design. With the iPhone 8 Plus weighing an extra ounce, the iPhone X is also the lighter of the two devices. Furthermore, measuring 6.24 x 3.07 x 0.30 inches, compared to the 5.65 x 2.79 x 0.30 inches of the iPhone X, the iPhone 8 Plus is a good 15 percent larger. Screen provisions are another key component of the iPhone X vs iPhone 8 Plus comparison, and the display of the premium iPhone X is certainly more impressive than its Apple cousin. The full HD retina screen of the iPhone 8 Plus can still be considered decent, but certainly doesn’t match up to the Quad HD wraparound display of the iPhone X. While the design of the iPhone X display is simply superior to the iPhone 8 Plus, the color reproduction and quality of the screen is also significantly better. 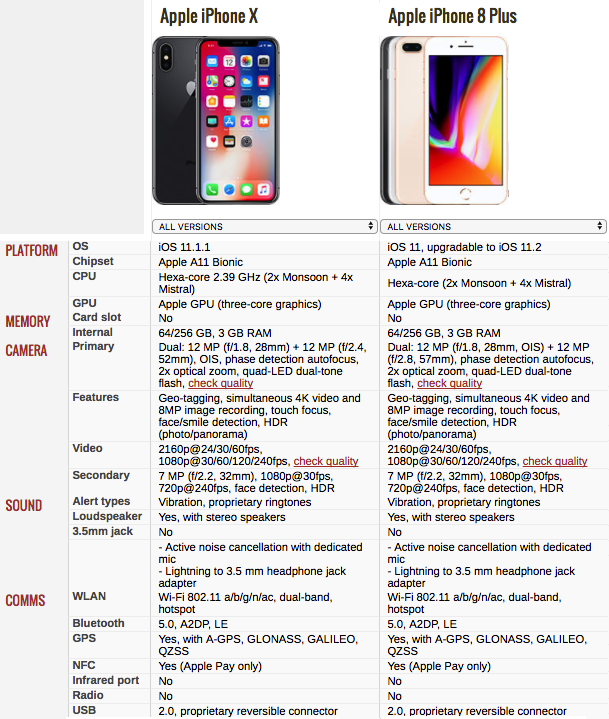 When comparing the raw specs of the two devices, this is hardly surprising. Looks are one thing, but performance is obviously a key front in the iPhone X vs iPhone 8 Plus battle. This is a particularly interesting area of comparison, as the two devices represent part of the same generation, and thus should be intended to perform fairly similarly. Indeed, both handsets feature the same 64-bit A11 Bionic system-on-a-chip with an embedded M11 motion coprocessor. Another similarity is that both smartphones have been fitted with a dedicated neural engine, ensuring that AI processing is optimized. Thus, benchmark performance between the two smartphones is pretty similar. And when operating the two smartphones, there is little difference in noticeable performance. This is definitely a massive plus point for the iPhone 8 Plus, considering that one must pay a significant premium in order to pick up the iPhone X. Battery life has been a bugbear of the iPhone range over the last few years, and thus this is also a critical area of comparison between the two devices. Apple claims that the lifecycle of the two handsets should be almost identical, but independent testing has indicated that the iPhone 8 Plus lasts slightly longer. This is probably to be expected considering it has the slightly bigger battery physically, as well as a more detailed screen than its cousin. The wireless charging included in both phones means that the iPhone X cannot even claim an advantage here, and this is another area in which the iPhone 8 Plus has a clear edge. The quality of the photography delivered by smartphones is becoming ever more important, and thus the iPhone X vs iPhone 8 Plus camera comparison will be a central area of concern. And there is no doubt that the snapper included in the iPhone X is slightly better than the iPhone 8 Plus shooter. This is mainly due to the dual optical image stabilization that the iPhone X has been found with, which is superior to the standard optical image stabilization included in the iPhone 8 Plus. Other aspects of the two cameras are comparable, but this improved functionality means that the iPhone X delivers superior results in still photography. However, the TrueDepth selfie camera of the iPhone X is much better than the FaceTime snapper included in the iPhone 8 Plus. While this isn’t the main photographic component of the two smartphones, the cultural power of social media means that this will put a lot of younger consumers in particular off purchasing the more affordable phablet. The general consensus of opinion, and indeed the specific statistical data, indicates that the Face ID system included in the iPhone X is superior to the traditional Touch ID on which the iPhone 8 Plus relies. Face ID also makes it more convenient to make Apple Pay payments with the iPhone X, enabling one’s face to act as a form of authorization. It is also known that the facial form of biometrics offers increased security over fingerprinting, meaning that the iPhone X is superior in this department. Users have also generally found the technology to be more convenient, meaning that Apple could choose to phase out Touch ID in the next couple of years. 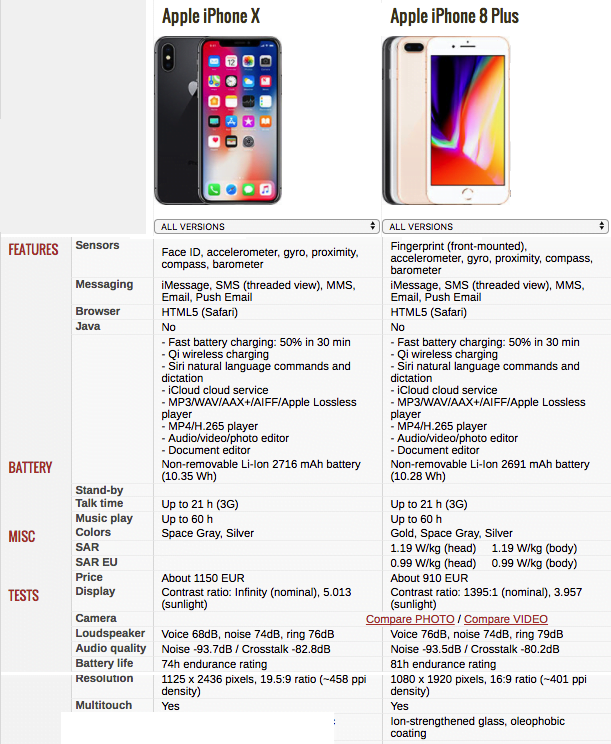 Generally speaking, the iPhone X and iPhone 8 Plus are pretty evenly matched in terms of specifications. Both offer the same amount of RAM and storage, while Apple surprisingly decided against delivering superior waterproofing or dustproofing provisions in the iPhone X. Certainly the two devices are very evenly matched in terms of general specs. The final key aspect of iPhone X vs iPhone 8 Plus comparison is the pricing of the two smartphones. While the price of both devices has come down since they were released, the iPhone 8 Plus can still be picked up for around $200 less than the premium iPhone X. This inherent affordability will obviously appeal to consumers on a budget. The iPhone X vs iPhone 8 Plus battle ultimately comes down in favour of the premium handset, as should ultimately be expected. 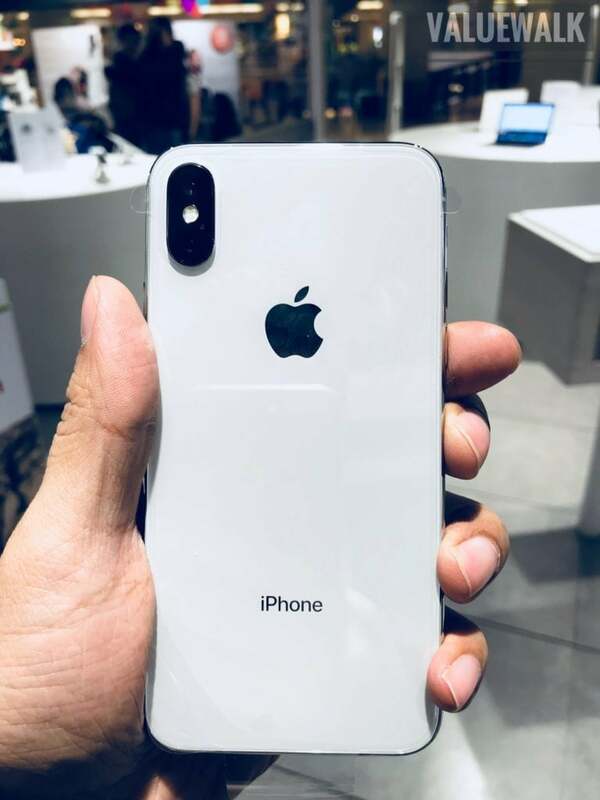 The superior photographic and display capabilities of the smartphone make it a better purchase than the iPhone 8 Plus, and it is reassuring to know that Apple has beefed up security with the Face ID system. However, those Apple fans picking up an iPhone 8 Plus can be assured that they are still getting a very decent smartphone for a smaller amount of money.